Asation! Gree! Terraform! Hypergate? Dread Masters! Swamps. 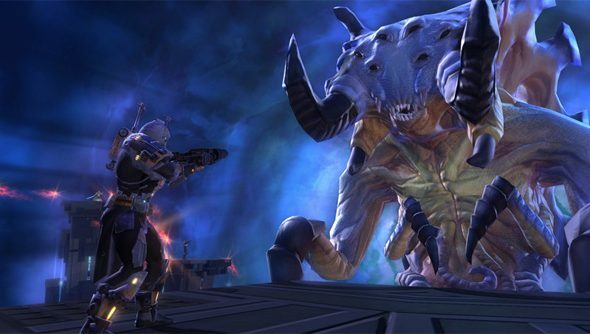 All this and more in the Terror from Beyond operation coming to The Old Republic in its imminent 1.4 update. If the science-fiction genre exists within Star Wars, the plot of Terror from Beyond would be some primo Twilight Zone fodder, with an ancient Hypergate on a terraformed swamp-planet calling forth ancient, untold monstrosities from the farthest reaches of the galaxy. It’s up to players to smack this weirdness back up its own trans-spatial portal before putting paid to the Dread Masters who’d switched the thing on. Oh yes. The developer update on the Star Wars blog describes the fourth operation to be added to TOR, which features a handful of new boss fights, including one with puzzle-y elements that requires multiple players to assist in repairing a big computer. “This one has players leveraging their particular group composition to control a chaotic situation,” writes lead designer Jesse Sky, tantalisingly. Also mentioned is a cameo from a “familiar face”, with speculation by some fans that Darth ‘Sodding’ Malgus is set to make an appearance. The difficulty is aimed squarely at players who’ve aced the previous operation, Explosive Conflict, and earned the campaign gear awarded by that instance. These plot-heavy end-game instances of TOR are perhaps the MMO’s crowning achievement. Terror from Beyond seems primed to continue that legacy well into the game’s free-to-play transformation, through the medium of horrifyingmulti-eyed space monsters.The 1.4 update is due to arrive in the coming weeks.